Shih-Tsen Nike Liu, Taichung City. Matthew Kaplan, University Park, PA. In 1977, the Tbilisi intergovernmental conference on environmental education endorsed a set of guiding principles for environmental education. Some principles, including considering the environment in its totality, viewing environmental learning as a continuous lifelong process, and taking a historical perspective into account, lend support for intergenerational approaches to environmental education. This set of approaches to environmental education is particularly pertinent in cities, where working toward sustainable development involves addressing a host of complex environmental, historical, and social issues. Intergenerational components of environmental education programs enrich the learning experience for participants of all ages. 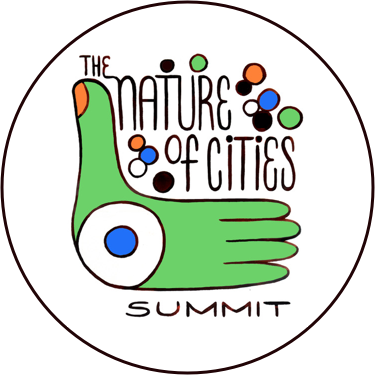 A child who has limited firsthand experience with the process of urbanization and accompanying economic, demographic, and environmental changes may have difficulty gaining a cognitive understanding and an emotional appreciation of the environmental challenges facing cities. Environmental education programs, resources, and materials certainly contribute to such learning. However, learning is enhanced when the child has direct access to the living experience and perceptions of older people who can share their experiences of changes in the urban environment over time. At the root of an intergenerational paradigm for environmental education is activating environmental learning through facilitating interactions between generations. Intergenerational programs have been defined broadly as social vehicles that create purposeful and ongoing exchange of resources and learning among older and younger generations (Kaplan, Henkin and Kusano, 2002). With regard to urban environmental education, the focus of intergenerational programs turns to ways in which young people, older adults, and the generations in the middle can work together to explore, build awareness, gain understanding, and improve the urban environment. Environmental education funding, research, and program design tend to target young people as the primary audience (Kaplan and Liu, 2004). One of the most significant social changes of our time, however, is the rapidly expanding number of older adults. In countries experiencing rapid urban-development, such as Taiwan, Japan, and the U.S., older adults will soon become the largest segment of the population. This demographic shift can be viewed positively. Contrary to negative age-related stereotypes, many older adults living in cities are healthy, lively, and actively engaged in civic affairs, including in volunteer initiatives aimed at protecting the urban environment. There are some notable accounts of environmental initiatives aimed at reaching and involving the older adult population (Ingman, Benjamin and Lusky, 1999; Benson, 2000), including older adult environmental volunteerism found in the U.S. (Bushway et al. 2016) and in Australia (Warburton and Gooch, 2007). However, the level of engagement of older adults in environmental education initiatives targeting younger generations still has room to grow. The relative disconnection of older adults from schools, environmental centers, and other settings that educate people about the environment represents a missed opportunity for strengthening community relationships in urban communities and instilling in children and youth a deeper sense of environmental awareness and connection. Scholars have documented the potential benefits of intergenerational environmental education (Ballantyne, Fien and Packer, 2001; Vaughan et al., 2003). However, the adults in some studies were passive learners who were not utilized as educators or co-learners during the learning process. The intergenerational initiatives highlighted in this chapter go beyond the goal of multi-generational inclusion or simply including members of different generations. An ideal intergenerational program creates opportunities for people of different age groups to learn about each other’s knowledge, experiences, skills, and perceptions. As participants learn about the impact of the environment in each other’s lives, they gain an awareness of common concerns. This contributes to an understanding of the interrelationships among people and the environment and a sense of how to work collaboratively to influence environmental policies and practices (Kaplan and Liu, 2004). Why consider intergenerational environmental education? In cities, the teacher-student ratio is commonly high and the teachers’ workload is heavy. In many countries, particularly in urban areas, the proportion of older adults in the population is growing. Well-designed intergenerational programs provide an institutional anchor and vehicle for taking advantage of this demographic trend; educated, civically engaged older adults who care about future generations and wish to make a contribution to their environmental learning can be recruited, trained, and engaged as human resources in support of environmental education programs (Kaplan and Liu, 2004). Many urban children do not live near their grandparents and have limited contact with older adults. Older adults in an intergenerational activity can serve as role models for younger participants to observe and imitate, which are important forms of learning (Bandura, 1977). Older adults also have life experiences that can make environmental content in textbooks more relevant and meaningful to young learners. For instance, older adults can readily share how they use natural resources with children in a community festival. Children learn things such as how to conserve water by using remaining bathwater to water flowers. As another example, while teaching topics such as chemical pollution hazards, an older adult who used to work as a toxics prevention agent or suffered from past pollution accidents can share his or her own experiences. Such conversation helps children to relate to environmental issues and to view environmental health risks from a lifespan perspective (Schettler et al., 1999). Environmental educators can structure intergenerational dialogue to nurture such long-term environmental perspectives (cf. Wright and Lund, 2000). Intergenerational programs provide older adults with opportunities to stay active, expand their social networks, and make valued contributions to society (Kaplan, Henkin and Kusano, 2002). A powerful motivation for older adults to volunteer for environmental stewardship activities is wanting to leave a legacy—both for the earth and for their grandchildren (Warburton and Gooch, 2007); a desire to leave a legacy could also motivate older adults to volunteer in environmental education programs. Intergenerational approaches to environmental education seek to promote dialogue, collaborative learning, and mutual understanding. Intergenerational programs tend to involve a broad spectrum of organizational partners and collaborators, thereby extending the reach and influence of environmental education and action messages across cities. The Lincoln Place “Futures Festival” event held in Pittsburgh provides an example of how a collaborative planning process involving residents of all ages, and representatives of local community organizations and agencies from multiple sectors, can broaden the visioning process to encompass the natural as well as the built environment. The process of having to reach consensus and integrate their diverse ideas into large murals encouraged participants to work together to create age-inclusive, economically vibrant, and ecologically sustainable visions for the future of Lincoln Place (Kaplan et al., 2004). What do intergenerational environmental education initiatives look like? Intergenerational environmental education initiatives can take place in multiple urban settings including schools, environmental education centers, parks, playgrounds, community centers, retirement centers, city streets, community gardens, and even vacant lots. Such educational initiatives can also be launched by different organizations and inter-organizational partnerships. A school that wants to let students know about the history of a local urban forest, for example, can partner with a local historical society whose members include older adult residents willing to share the history of the site and discuss factors that influenced changes. An urban environmental center wanting to hold an air pollution monitoring fair that attracts residents of all ages can work with youth service and senior volunteer organizations to establish intergenerational teams working together to develop, set up, and staff interactive exhibits at the fair. Educators across the global are creating models to stimulate intergenerational dialogue and co-learning about the natural environment. For example, Tanaka (2007) describes a school-based project in Japan in which students and adult volunteers developed a miniature biosphere to heighten their environmental awareness and appreciation. Chand and Shukla (2003) describe an intergenerational biodiversity contest in India designed to enhance learning about plants and promote values of conservation and respect for traditional ecological knowledge. Garden Mosaics is a science education and national outreach program developed by Cornell University that combines community action and intergenerational learning. Through interviewing elder gardeners, youth ages 10-18 learn about the mosaic of plants, planting practices, and cultures in urban community and other gardens (Figure 1). Youth participants balance what they learn from elder gardeners with learning from “Science Pages” developed at Cornell, which explain key science principles behind the practices youth observe and learn about from elders in the gardens (Kaplan and Liu, 2004). Figure 1. 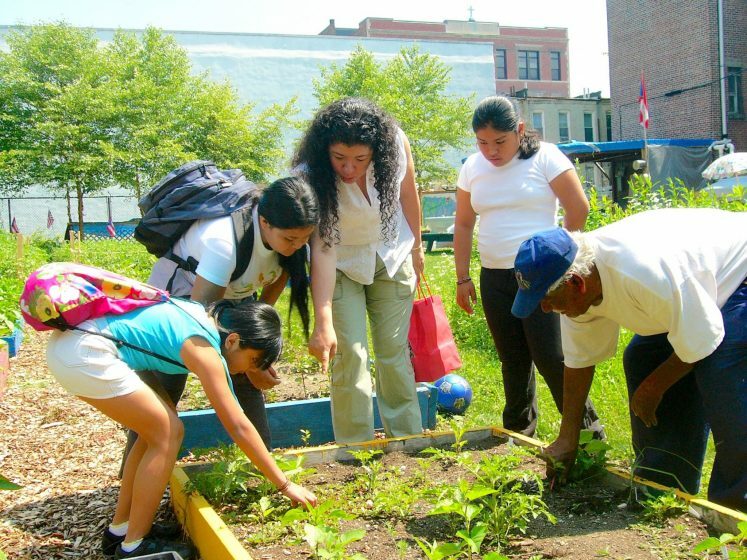 Young people and an educator in Abraham House, the Bronx, New York City, learn from an elderly gardener (right) in a community garden. Credit: Alex Russ. Two additional examples, one from a formal education in Taiwan and the other from non-formal education in the U.S., illustrate elements of intergenerational urban environmental education programs (Table 1). The first program took place at He-cuo Elementary School in Taichung, Taiwan’s third largest city. The teachers and principals invited senior adults from the community to participate in a series of intergenerational activities. The senior volunteers’ opinions were taken into account throughout the planning process. Over the ten years of the program, new activities and volunteer recruits were continually integrated. On a city tour, children learned about old trees in the He-cuo community and listened to the elders’ stories about the trees. In other activities, participants observed juxtaposed old and new photos to learn about environmental changes over time, and students learned about differences between rural and city lifestyles through displays of traditional farmers’ equipment. These and other activities combined to have an impact on student, teacher, and even nearby residents’ awareness of community changes associated with urbanization. The program also helped students weave this historical context into their sense of local identity. Table 1. 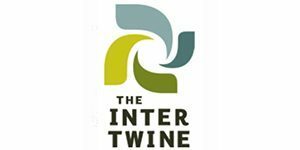 Urban intergenerational environmental education programs in Taiwan and the U.S. The second example is a 4-day-residential program located at the Shaver’s Creek Environmental Center, approximately 14 miles south of downtown State College, Pennsylvania. The researchers conducted an experimental study to determine the effectiveness of an intergenerational program versus a mono-generational program (Liu and Kaplan, 2006). In the intergenerational condition, a group of older adult volunteers participated in the program as co-learners and assistant instructors working with students to teach about traditional tools, such as darning eggs (an egg-shaped piece of wood inserted into the toe or heel of a sock during mending), and to share environment friendly living habits. In another activity, the students were asked to discuss the possibility of converting the Environmental Center into a shopping mall. Students recognized that the development would have negative environmental consequences. At that point one of the senior volunteers shared a pertinent example from personal experience; residents of her childhood community successfully organized against a massive development plan that entailed replacing natural woodland with an airport. Such real life stories helped students to better understand the process of community change and the potential influence of local residents. How to implement intergenerational environmental education initiatives? Beyond program activities per se, organizational partnerships have a bearing on program structure and success. The critical step is to invite local leaders, stakeholders, and senior volunteers to join the planning process of the environmental education program. In the above example, the He-cuo Elementary School recruited older adult participants from local organizations including a Salvation Army center, a Taoism temple, a women’s club, a traditional orchestra, and a puppet performance museum. These organizations have had a long-term relationship with the He-cuo school starting at the beginning of the environmental education activities. They also help with school functions, such as student enrollment, holiday festivals, and student club advising, thereby broadening the school-community partnership beyond the environmental education program. Other organizations in urban areas can make good partners for helping to recruit local youth as well as older adults, such as 4-H clubs, scout troops, after-school programs, universities, animal shelters, and senior and community centers. Across the globe, intergenerational environmental education programs are being implemented in diverse urban settings. In order to build partnerships, environmental educators can seek out organizations with similar or complementary interests and objectives. For instance, a university may hold a class for elders about urban plants, and the adult students can partner with an elementary school’s nature class. Or the older members of a community photography club can be invited to play a role in an intergenerational activity aimed to enhance environmental awareness. Integration of an intergenerational component into environmental education activities also introduces complexities and considerations with regard to program design. The following principles contribute to productive group dynamics and learning effectiveness in intergenerational programs (Kaplan and Liu, 2004). Prepare participants of both generations before the program begins. Draw upon both the youth’s and adults’ experiences and talents. Promote extensive dialogue and sharing among participants. Focus on the relationship among participants as well as the task. Pay attention to safety for different age groups. Design tasks that require the active participation of both generations to be completed. Sustainability is an intergenerational concept. Meadows, Meadows, and Randers (1993) define a “sustainable society” as “one that can persist over generations; one that is far-seeing enough, flexible enough, and wise enough not to undermine either its physical or its social system of support.” When considering how natural resources are used/misused over time, as well as strategies to preserve and enhance the environment, it is important to engage in long-term thinking and strategic policy making. Environmental educators can structure intergenerational dialogue to nurture such a long-term environmental perspective of the environment (cf. Wright and Lund, 2000). At the same time, older adults who volunteer in such programs gain opportunities to stay active, contribute, and connect meaningfully with young people in their communities. Ballantyne, R., Fien, J. and Packer, J. (2001). School environmental education program impacts upon student and family learning: A case study analysis. Environmental Education Research, 7(1), 23-27. Benson, W. (2000). Empowerment for sustainable communities: Engagement across the generations. Sustainable Communities Review, 3, 11-16. Bushway, L. J., J. L. Dickinson, R. C. Stedman, L. P. Wagenet, and D. A. Weinstein. 2016. Engaging older adults in environmental volunteerism: The Retirees in Service to the Environment program. The Gerontologist, online. Chand, V.S. and Shukla, S.R. (2003). “Biodiversity contexts”: Indigenously informed and transformed environmental education. Applied Environmental Education and Communication, 2(4), 229-236. Ingman, S., Benjamin, T. and Lusky, R. (1999). The environment: The quintessential intergenerational challenge. Generations, 22(4), 68-71. Kaplan, M. and Liu, S.-T. (2004). Generations united for environmental awareness and action. Washington, DC: Generations United. Kaplan, M., Henkin, N. and Kusano, A. (Eds.). (2002). Linking lifetimes: A global view of intergenerational exchange. Lanham, Maryland: University Press of America. Kaplan, M., Higdon, F., Crago, N. and Robbins, L. (2004). Futures Festival: An intergenerational strategy for promoting community participation. Journal of Intergenerational Relationships, 2 (3/4). 119-146. Liu, S.-T. and Kaplan, M. (2006). An intergenerational approach for enriching children’s environmental attitudes and knowledge. Applied Environmental Education and Communication, 5(1), 9-20. Meadows, D.H., Meadows, D.L. and Randers, J. (1993). Beyond limits. White River Junction, Vermont: Chelsea Green Publishing Company. Schettler, T., Solomon, G., Valenti, M. and Huddle, A. (1999). Generations at risk: Reproductive health and the environment. Cambridge, Massachusetts: The MIT Press. Tanaka, M. (2007). Effects of the “intergenerational interaction” type of school biotope activities on community development. In Yajima, S., Kusano, A., Kuraoka, M., Saito, Y. and Kaplan, M. (Eds. ), Proceedings: Uniting the generations: Japan conference to promote intergenerational programs and practices (pp. 211–212). Tokyo: Seitoku University Institute for Lifelong Learning. Vaughan, C., Gack, J., Solorazano, H. and Ray, R. (2003). The effect of environmental education on schoolchildren, the parents, and community members: A study of intergenerational and intercommunity learning. Journal of Environmental Education, 34(3), 12-21. Warburton, J. and Gooch, M. (2007). Stewardship volunteering by older Australians: The generative response. Local Environment, 12(1) (2007), 43-55. Wright, S. and Lund, D. (2000). Gray and green? Stewardship and sustainability in an aging society. Journal of Aging Studies, 14(3), 229-249. 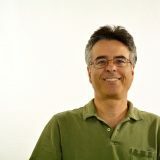 Matthew Kaplan is Professor of Agricultural and Extension Education and works with Intergenerational Programs and Aging at Penn State University. 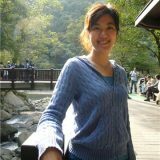 Dr. Liu is Associate Professor in the Master’s Program of Environmental Education and Management at the National Taichung University of Education and Chief Secretary of the Chinese Society for Environmental Education.